Many florists who work from their home start out as people who love to create amazing arrangements. Their individual style shows in their designs. This hobby can quickly grow into a business that provides a source of income for what you do best. Helping you protect your business is what we do best. Protection for someone slipping and falling at your home when picking up an order or while selling your products at a craft fair. Protection for the property you use in your business including the theft or damage of your equipment. Protection for errors that you make in the course of doing business that cause financial loss to others. For example, you incorrectly schedule to make floral arrangements for a wedding on Saturday when the event is on Friday and you cannot make the arrangements in time. 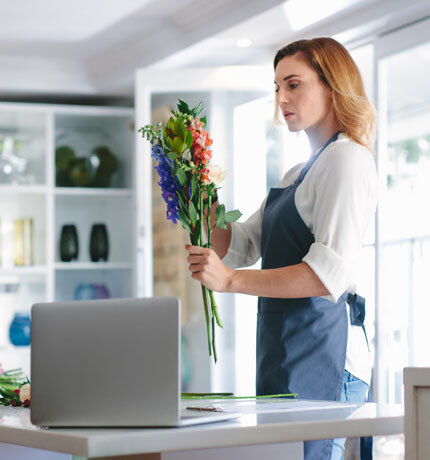 Professional liability would provide coverage for any extra expense that the host incurs in finding new flowers at the last minute. Protection for the lost income due to your home being uninhabitable. For example, your home has a fire and you need to rent temporary space on a part-time basis to fulfill orders. The extra expense incurred due to the fire would be covered. Avoid slip and falls - Maintain a clean and dry floor around your work area to prevent slip and falls when customers are picking up their orders at your home. Check your arrangements to make sure that they are free from leaks and do not overflow. Keep track of your schedule - Develop an accurate calendar so that orders are completed on the proper day and you have enough time to create the arrangements. A wedding without flowers can result in a big claim, which can damage your professional reputation. Be careful with your tools - Keep tools and supplies in an organized spot when working at home and away from home to minimize theft. Be sure to also keep sharp tools away from young hands.